The graves were simple white painted slabs with a matching headstone. There were five in all: two were for the nine English militia killed in a skirmish in 1989 with the Maori rebel chief Te Kooti; the rest were the graves of later settlers. Even with dusk falling and a steady rain falling it was a beautiful clearing. We turned and headed back into the Opepe Nature Reserve, the main reason for our visit, and followed the path through majestic native forest with giant Rimu and Matai trees, unique to the Taupo region as it is the only remaining virgin forest. The poor light and wetness only served to highlight the density of the vegetation all around us. Amongst the smaller trees and undergrowth the large Rimu trunks, deeply ribbed and roughly barked in their antiquity, powered out of the ground. A few days earlier we had also been in the company of giants. On the short walk in we had seen huge stands of tree ferns and our first Lancewood, a plant with long thin leaves like a swordfish bill designed expressly to keep hungry dinosaurs at bay. Then through a gap we spied what looked like a perfect pillar of weathered granite thrusting straight upwards. A Kauri tree. The trunk rose branchless and true for 70-feet at least before the crown branched out in all directions way overhead spreading an enormous canopy of leaves. The Kauri has a habit of forming small clumps scattered through mixed forest and more appeared as we got closer, dwarfing everything around. Kauri forests are among the most ancient in the world and part of their success is due to the fact that as they grow the lower brances are shed, preventing vines from climbing, and their flaking bark defends them from parasitic plants. They are not the tallest trees, but the superbly cylindrical trunks, free of knots, means they yield the largest volume of timber. Thus the very reasons for the Kauris longevity also led towards its downfall. During the 19th-century wood mills, loggers and saw doctors were seldom unoccupied for long and 90% of the area of Kauri forest standing before 1000AD was destroyed by about 1890. 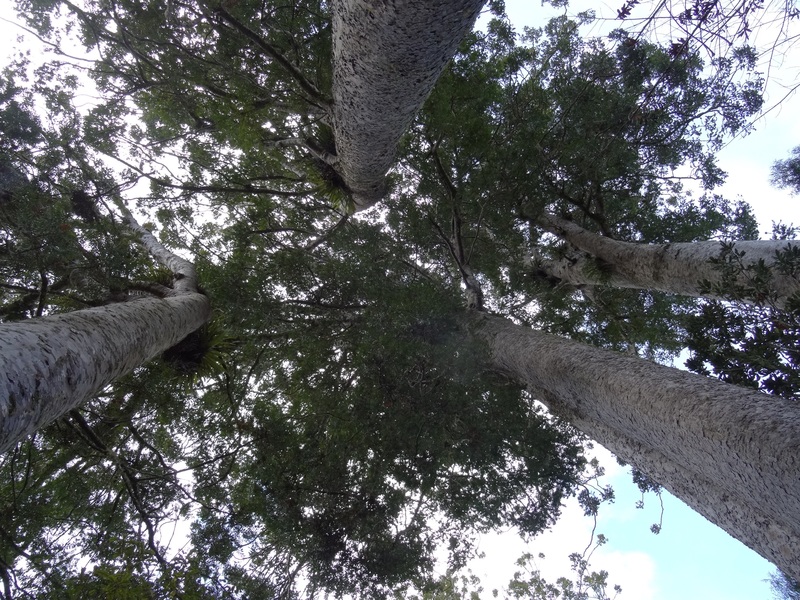 I stood beneath a trio of Kauri and craned my neck backwards to try and take in the scene. It was magnificent, I felt as though I was standing in some arboreal cathedral whose massive pillars towered into the sky before erupting in a spectacular tracery of branches. These Kauri crowns dominate the canopy and carefully incline innumerable leaves all in thrall to the sun. Today is 25th April 2015, ANZAC day, and commemorates the landing of the Australian and New Zealand Army Corps on the beaches of Gallipoli in Turkey during the First World War. For many the last thing they saw was the foaming water as it rushed towards their falling bodies. For a small country New Zealand sent just over 100,000 men to answer the call of Empire, a tenth of the population at that time and the loss of 18,000 soldiers was, in relation to population, the largest loss by a single country. The war united the country in a way that was to transform it, weakening the links to England and ultimately leading to nationhood and a strong sense of regional identity. We woke at 5am and in the cold pre-dawn made our way with countless others to the war memorial in Wanganui, a town on the south-western corner of the North Island where the first ANZAC remembrance event was held 80-years ago. Today also marked the centenary of the landing and so was even better attended than usual. I had never been to a remembrance service and had only ever given them a cursory glance on the television. But listening to the sound of the Scottish pipe band brought back memories of my paternal grandfather who had been on the beaches of Gallipoli through the heat and the snow for 8-months. He had told a few light-hearted stories about his time there when I was younger but had probably spared us the real horror. However, I do remember him saying that if you had to spend 8-months pinned down on a beach being shot at from above then the Kiwis and the Aussies were about as good a bunch of men to be with as you could ever hope to find. It was good to remember him, a rather strict man at times but always ready to kick a football around with his grandchildren (even at age 80) and he loved a good story. It was also poignant to reflect on the fact that if he had not made it off the beach then I would not be standing here today. The last post played and for me, as for so many, it has to be the saddest piece of music in the world. The female minister presiding over the ceremony told a story of a meeting between a Turkish and an English Officer to discuss the removal and burial of thousands of bodies caught in the infamous ‘neck’. The Turkish Officer, on surveying the scene, commented “At this spectacle even the most gentle must feel savage, and the most savage must weep”. From the Kauri Grove, to the graves at Opepe, to Gallipoli I have been reflecting on forest destruction and the utter senselessness and waste of war in human terms. The recurring image of things that have fallen, whether by the saw’s caress or a sniper’s bullet, has stayed with me. Both are tragic, avoidable and often irreconcilable. All this leaves me feeling a little heavy in myself, weighed down by something too awful to both fully understand and accept. This entry was posted in Life, South Pacific, travel and tagged ANZAC, Australia, chaos, compassion, Gallipoli, Kauri, Kiwis, Maori, New Zealand, Opepe, Remembrance, Rimu, Taupo, Te Kooti, travel, travels, trees, War, World War I, WWI by Ashby's World. Bookmark the permalink.